Simple Tips For Blogs Bloggers Blogspot, and Wordpress too. Blogging like Social Media and Networking has become a bigger, and more popular thing to do. It attracts people, everyone likes to see other ideas, read, learn, they are informative, good promotional tools to use, and just a little bit of everything really. Many want to blog, yet many don't know where to start. Another issue is am I doing this right, how do you know what you are doing is good enough, how long does it take, and so on. All of them wonderful thoughts. 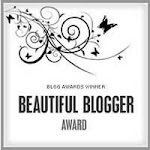 So, I will share a few ideas with you about blogging that come from me, and actually many other bloggers put together. Please remember that there is no right, or wrong that is shared with you. Just ideas, some thoughts, and things that have been found to be helpful. Choose a Personal Theme. You are wondering what is meant by this. Consider blogging about what you are most passionate about. It is quite alright to have more than one subject as many of us have more than one passion, or more than one thing we like to spend our time with. Pick themes such as Vintage, Collectibles, Thrifting, Crafts, Handmade, Homemade, Lifestyle, Photography, Writing, and there is a lot out there to choose from. It is best to choose the tings you are passionate about because the love you share for those things will also be seen by others, and they can relate with you as well. Keep in mind if you start blogging about what you see others doing your chances are that within a few months you will feel uninspired. You will feel the need for a change, and might become discouraged too. Remember, things all take time, and once you find your niche for blogging it will be beneficial, enjoyable, and can be fun too. When Blogging Don't Feel the Need to Do It All. You do not have to blog about everything, only what you wish to share. If you are not at all comfortable about sharing your personal life....than don't do it. If maybe you don't like vintage collectibles you do not have to blog about it. The point is with blogging you can give yourself complete control, and you have no obligations of doing what other bloggers are doing. Keep in mind to Do what you Love, Be Confident with it, and with your choices. Others will see this with what you share. Doing less can also be a strength as well too. I do recommend that you keep a regular schedule of doing posts on your blogs. Now, don't stress out about this. It's important to choose a schedule that fits with your Lifestyle so you can enjoy creating your posts each, and every week. Keep in mind that consistency is memorable to those who follow, pass through, and like to roam blogs. You will want to Network, and Make Blog Pals as well too. One place to go to is creating a Bloglovin account to help with some of this. 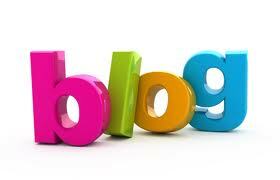 Here you will discover other blogs that you enjoy, can follow with them, and learn some things from them too. Again, there is no right or wrong to this. Enjoy making connections through social networking, and keeping in touch. Helpful to cross promote with friends. Enjoy making some New Friends too! Practice with Photography, and Develop Your Own Style. With most of the blogs photography can be a big deal. Using photography can help attract others to your blogs. You don't need a fancy camera to do this, or some fancy editing software either. Just start with what you know, and sometimes that is all you need. With my main page of my blog that you always visit I generally don't show much in pictures unless it is something pertaining to the subject at the time of my postings. My pictures for items I refound for vintage, collectibles, resell, repurpose, and etc is found with my other main page here LilacsNDreams Shoppe. It is my preference to keep mostly business kept to that page while with my main page I can share a little bit of everything that I see, learn, found, read, and etc. These notes to you about blogging are just some simple helpful tips I hope that will help those who are thinking about blogging. What topics to share is always of some concern to many. Me? I keep a book, notepad, paper, or something to make a note on when I have an idea. My Idea Book is what I call it. I make notes of things to try, to maybe talk about, maybe I want to research a topic more in order to share it, and etc. It has been helpful to do this. Know that with time your blog will get better. I myself am not an expert. I have learned things over time, and still am learning. I add things, remove things, change things, but it is my blog, and I do what I feel is right for me, and what my purposes are. What I am comfortable with is the proper way. My Best Advice to give to everyone who is starting out blogging, or thinking about it.....I will never tell you what to do with your blog. I can only suggest, and share things from time. Blogging is your freedom, a part of you, a part of what you do, and it becomes your creation. So enjoy blogging, have fun with blogging, and it really is not as bad as it seems starting out. It seems over whelming because it might be something new, but once you get the feel for it, and find your way of doing things, you will enjoy it very much! 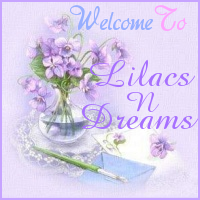 Thanks for sharing your time with LilacsNDreams today. 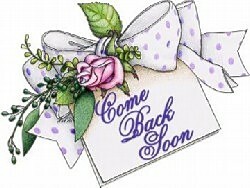 Come back to visit again soon. All so true and encouraging. Another tip I just starting using, is when ideas come up for a blog you can put them in draft form on your blog. This way you have a start of a post and can go back and edit, tweak or update as needed until you are ready to publish. LOL:) Victoria....thanks for that reminder, and I had to chuckle at that as I just started one of my posts for next week - my weekend thing I do:) Over time I have learned with my postings to make my notes, and do my postings, and then schedule them for the day, and the time I want them to publish. This has been a life saver in the scheduling of things. Also, when I have them scheduled as you noted...I can always go back to add something, or change something before it publishes to everyone to see too. I did see you on my blog, LilasNDreams, how did you get their? Also I have been reading your information on blogging. Very helpful. Can I put some of your comments on my blog? So other blogers can see?